When it comes to collaboration tools, your choices are myriad. There are numerous vendors and platforms, plus you’ll have to consider on-premise vs. cloud vs. hybrid deployment options too. 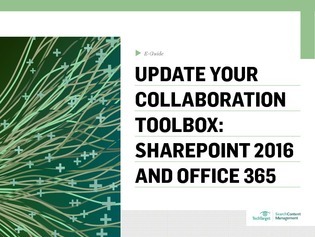 In this expert e-guide, we take a look at your options for migrating to SharePoint 2016 vs. using Office 365 for collaboration in conjunction with tools like SharePoint Online.